It's All About the Journey...What's Love Got To Do With It? Flowers, candy, red hearts and romance... that's what Valentine's Day is all about, right? Well, maybe not. The origin of this holiday for the expression of love really isn't romantic at all -- at least not in the traditional sense. Instead crime, imprisonment and execution are at the genesis of our modern day love fest, dating back to the man whose martyrdom may have inspired the holiday. 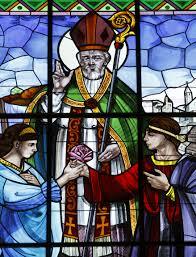 There were reportedly three early Christian saints named Valentine, but the one the holiday is likely named after was a Roman priest during the 3rd century A.D. under Emperor Claudius II. The Roman Empire was experiencing massive turmoil at the time. Dubbed the "Crisis of the Third Century" by scholars, this period saw the empire divide into three competing states, with the threat of invasion all around. Claudius II made the unpopular decision to ban marriage among young people, believing that unmarried soldiers fought better than married soldiers. With the Roman Empire hanging by a thread, Claudius needed all the brazen war power he could get. This is where Valentine comes in; the pesky priest who believed marriage to be a God-given sacrament. Valentine began officiating marriages in secret but was eventually found out and imprisoned. The advent of the Valentine's Day love note may have come about from young children passing Valentine notes through the prison bars, but this may be embellishment to an otherwise tragic story. In the year 269 AD, Valentine was sentenced to a three part execution of a beating, stoning, and finally decapitation all because of his stand for Christian marriage. The story goes that the last words he wrote were in a note (professing his love?). He inspired today's romantic missives by signing it, "from your Valentine." The priest was named a martyr by the Church because he gave up his life to perform the sacrament of marriage: for love of love and love of God. At the end of the 5th century, Pope Gelasius I declared February 14th to be St. Valentine's Day, and centuries later romantic authors like Geoffrey Chaucer and Shakespeare helped seal the deal with references to the day in their works. By the Middle Ages, Valentine became one of the most popular saints in England and France. Despite attempts by the Christian church to sanctify the holiday, the association of Valentineâ€™s Day with romance and courtship continued through the Middle Ages. The holiday evolved over the centuries. 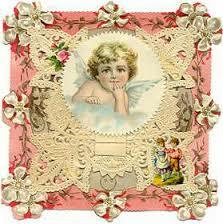 By the 18th century, gift-giving and exchanging hand-made cards on Valentine's Day had become common in England. Hand-made valentine cards made of lace, ribbons, and featuring cupids and hearts began to be created on this day and handed over to the man or woman one loved. This tradition eventually spread to the American colonies. 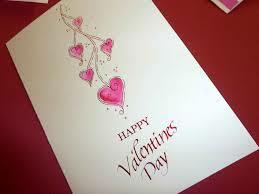 It was not until the 1840s that Valentine's Day greeting cards began to be commercially produced in the U.S. 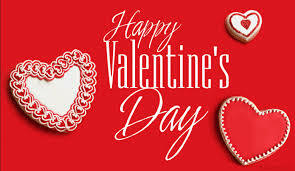 The first American Valentine's Day greeting cards were created by Esther A. Howland, a graduate and native of Worcester. Mass. Howland, known as the Mother of the Valentine, made elaborate creations with real lace, ribbons and colorful pictures known as "scrap". It was when Howland began making Valentine's cards in a large scale that the tradition really caught on in the U.S. In the second half of the 20th century, the practice of exchanging cards was extended to all types of gifts. Such gifts typically include roses and chocolates packed in red satin, heart-shaped boxes. In the 1980s, the diamond industry began to promote Valentine's Day as an occasion for giving jewelry. 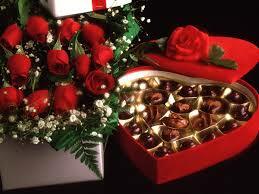 Today, Valentine's Day is one of the major holidays in the U.S. and has become a booming commercial success. According to the Greeting Card Association, 25% of all cards sent each year are "valentine's". The "valentines", as Valentine's Day cards are better known as, are often designed with hearts to symbolize love. 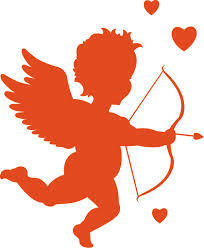 And then there's Cupid... Valentine's Day would not be complete without Cupid, the most recognized symbol of love. It is said that if Cupid shoots his arrow of love and hits you, that you will fall helplessly and madly in love with the next person you meet. In Roman mythology, Cupid is the son of Venus, the goddess of love. In Greek mythology, he was known as Eros and was the son of Aphrodite, either way - good genes. According to Roman mythology, Cupid fell madly in love with Psyche despite his mother's jealousy over Psyche's beauty. Even though he married her, he also told her never to look at him. He visited her only at night. Her sisters convinced her to look at Cupid despite his warning. So she lit a lamp one night so she could see him. Cupid then left her. Cupid, who really loved Psyche all the while, came upon her lifeless body. He forgave Psyche and swept the deadly slumber back into the box. The gods then made Psyche a goddess. At this point it is appropriate to say "and they all lived happily ever after". Oh, by the way, if he hits you with one of his arrows, you too will live happily ever after! Did you know? Cupid is sometimes shown blindfolded. Why?...Because love is blind!